This article has been updated with new restaurants on 1st September 2018. 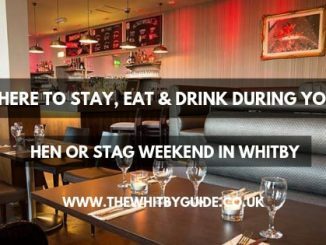 Whitby has become an increasingly popular tourist destination over the last few years and as a result, there are a wide variety of Whitby restaurants to choose from. Just walking through the centre of Whitby, or even along the seafront, you will find a wide variety of restaurants that all offer different types of cuisine. Regardless of what you are feeling in the mood for, chances are there will be plenty of restaurants in Whitby to satisfy your hunger. With Whitby being a seaside town, there are naturally no shortage of places where you can get some high quality fish and chips. There are also a number of Whitby restaurants where you can get find locally sourced seafood. The majority of restaurants in Whitby pride themselves on being able to source all of their ingredients from the Yorkshire area, so then people who are visiting are able to try some genuinely local food. There are so many high-quality restaurants in Whitby that it is very difficult to name just a few that would be considered among the best. 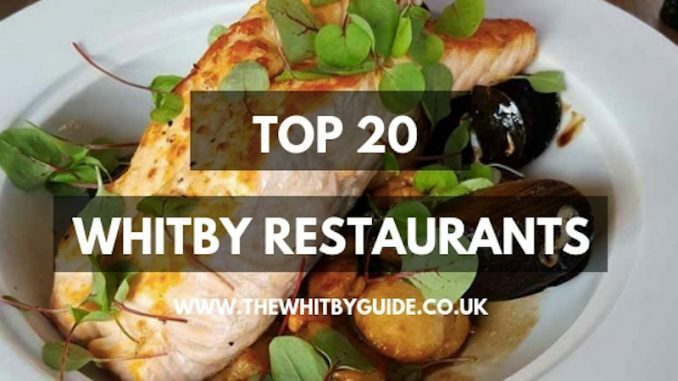 Here are 20 highly recommended Whitby restaurants for you to enjoy. Use the links below to navigate to your favourite cuisine. 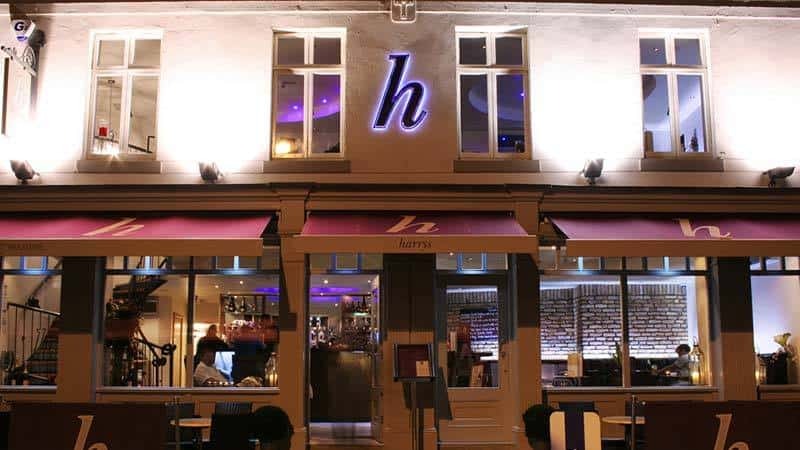 Harry’s is a modern and luxurious lounge bar located in the centre of Whitby. It has been open since 2008 and offers visitors a mixture of cocktails and wonderful food. 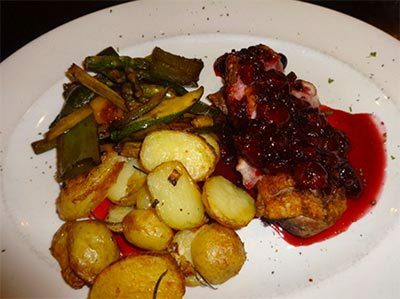 The restaurant provides special menus for lunch and evening meals and has a wide range of speciality meat and fish dishes that they are very proud of. Their bar offers a wide range of cocktails and other drinks and they strive to change their menu constantly to match the change in seasons. If you decide that you want to spend the night at Harry’s Bar, they have three luxurious rooms available that offer a wonderful view of Whitby centre and harbour views. For those of you with a four-legged friend in tow, you can sit outside of Harry’s under the heaters and blankets are provided. I’ve had many bowls of mussels while sat outside watching the world pass by. Harry’s Bar offers a unique “tapas” style menu which is perfect for sharing. 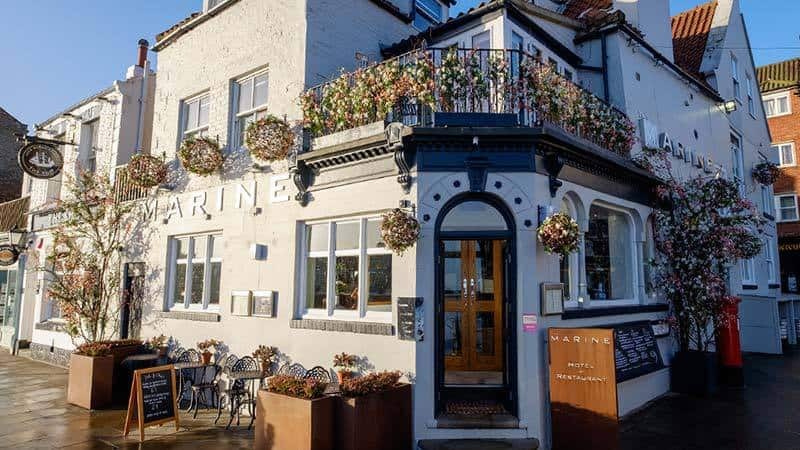 Much like Harrys Bar, The Marine opened in 2008 and has grown in popularity ever since then. While The Marine also operates as a hotel, it’s their restaurant that has become one of the more popular places to visit in Whitby. 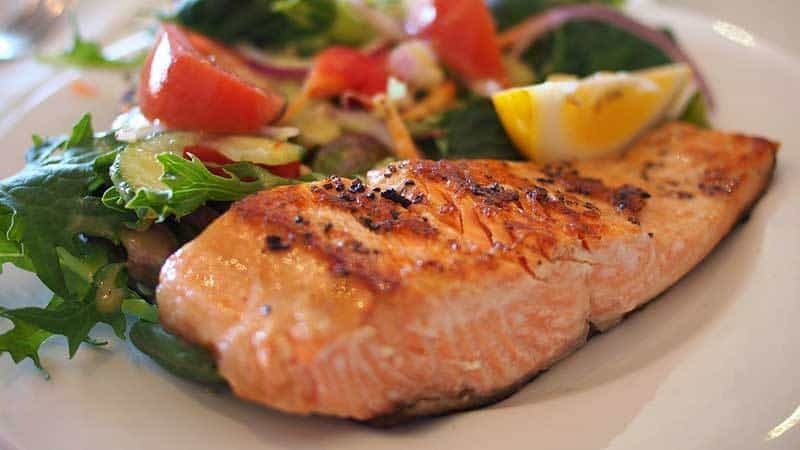 Their restaurant specialises in providing seafood, all of which has been locally sourced in the Whitby area. They also offer a wide range of other foods as well, including a varied breakfast menu that offers a range of meat, fish and vegetarian options. 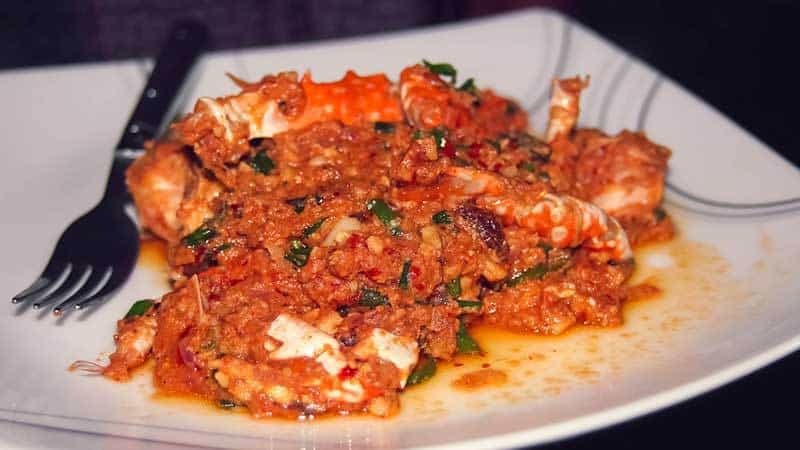 Their seafood menu includes oyster and caviar dishes that are among the most popular in the restaurant. 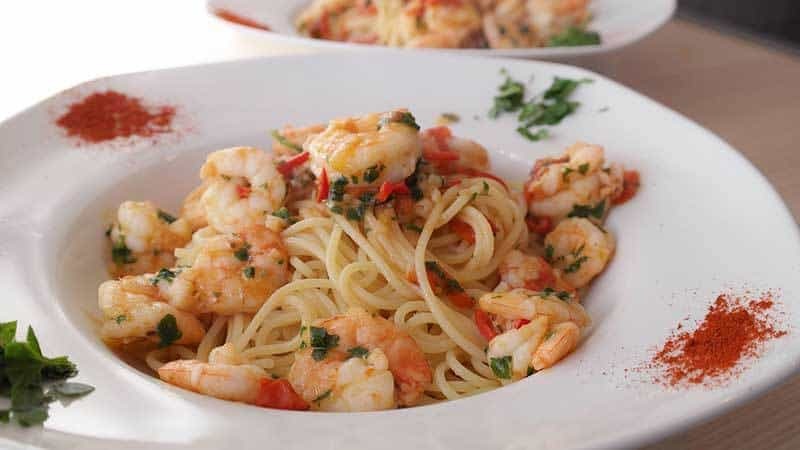 The Shellfish Linguine is my personal recommendation. It’s also one of the Marine’s most popular dishes. 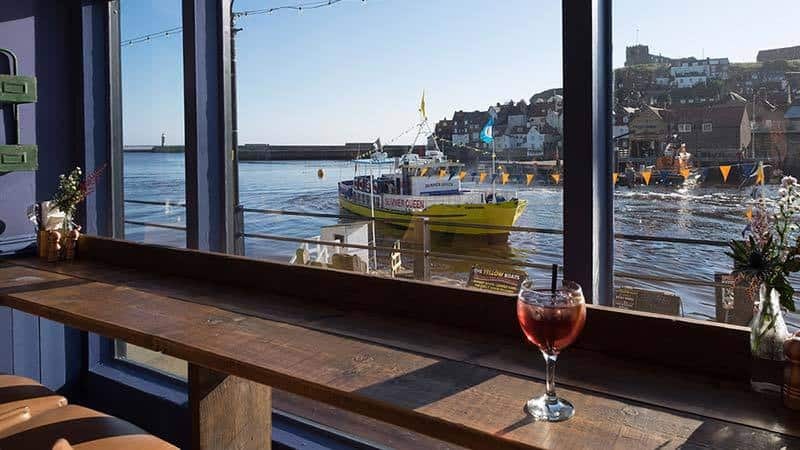 If you are looking for a restaurant in Whitby that can give you a really great view of the harbour while you enjoy quality food, then the Moon & Sixpence is definitely a place worth visiting. It has a wonderful relaxing and chilled out atmosphere where you can sit down and just have a nice cocktail while enjoying the view, or you can sit down to a nice evening meal as the sun sets. They offer a wide range of fish dishes, including fish pie and good old fashioned smoked haddock. All of their seafood is fresh daily and is locally sourced as well. The Moon & Sixpence offer great lunch snacks along with fine dining in the evening. 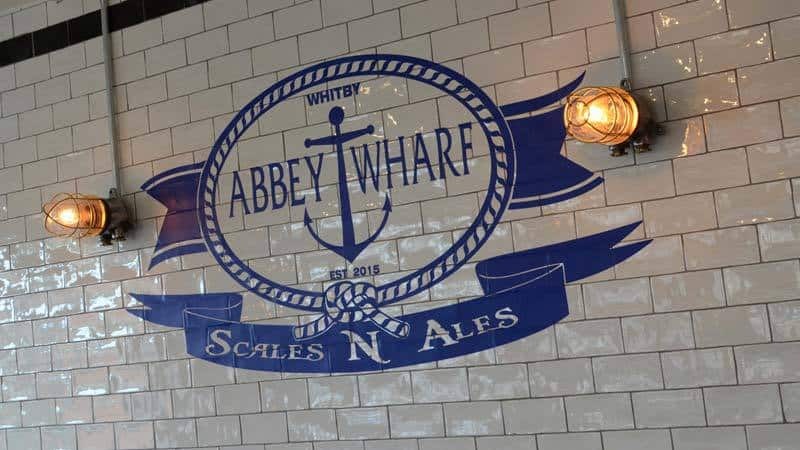 Abbey Wharf recently re-opened in 2015 and offers fantastic views of the harbour in this stunning panoramic restaurant. Serving a variety of delicious seafood, steaks, salads and other dishes, alongside vegetarian options. 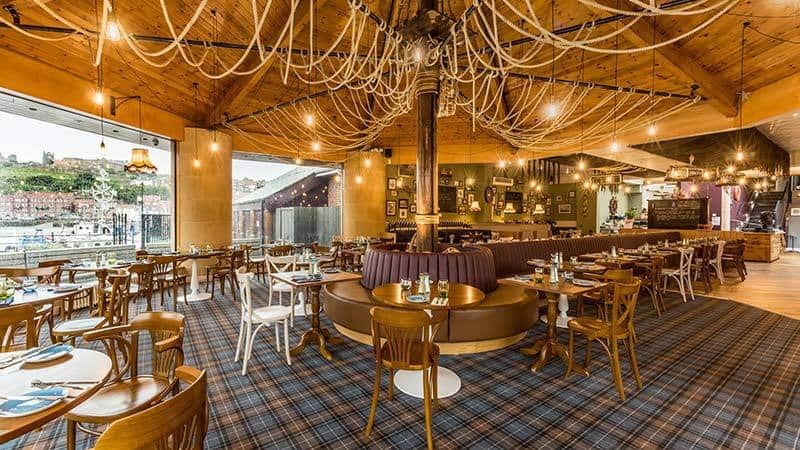 Abbey Wharf has established itself as one of Whitby’s premier restaurants and bars. Open from 12pm every day. Live entertainment is also commonplace, especially during busy periods and weekends. Abbey Wharf is also dog friendly, you can even take your dog for an evening meal! The stunning panoramic balcony allows you to soak in the Whitby atmosphere, day or night. The balcony at Abbey Wharf offers stunning views of Whitby, although it can be a little cold in winter! Mademoiselles Cafe Bistro in Whitby is open for teas, coffees, cakes, light bites & lunches and evening dinner. They offer a wide range of cognacs, gins, spirits, wines, fizz & beers. Mademoiselles offer a day and evening menu with a selection of seafood, meat and vegetarian dishes including starters and lite bites. If your looking for a restaurant in Whitby with sea views then there is no better view in town than from The Fishermans Wife. The restaurant services traditional fish and chips along with an extensive seafood menu, including some mouth-watering shellfish dishes. 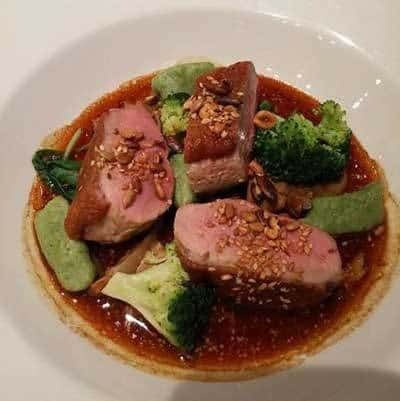 All ingredients used at the restaurant are locally sourced wherever possible and the friendly staff are always happy to assist you with any meal selections or dietary requirements. The location of The Fishermans Wife couldn’t be better, just a short walk down through the Whale Bone Arch from the bed and breakfasts and hotels on the West Cliff. 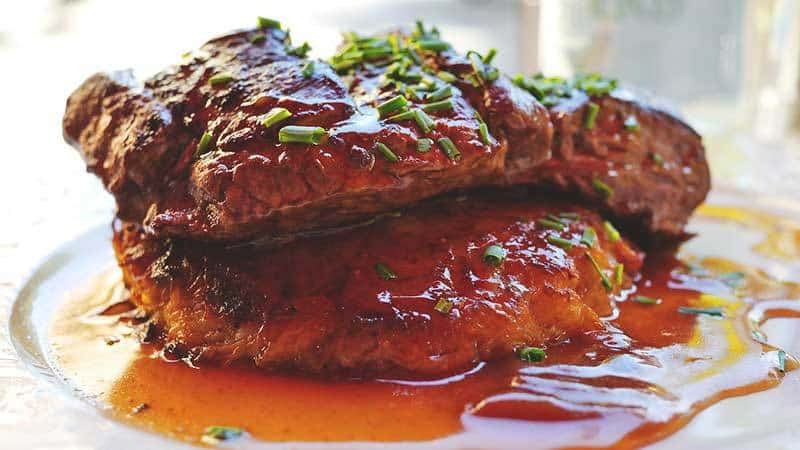 The Star Inn The Harbour’s Menus feature Catch-of-the-Day fish and meat specials and also world famous North Yorkshire Moors produce, such as furred and feathered game, as well as a seasonal All Day Menu. Desserts will come predominantly from the restaurant’s Ice Cream Parlour, including some childhood classics, brought up to date. Traditional Cod and Haddock are fried in a gluten-free batter, originally developed with coeliac customers in mind, but it was so good that they have made it their standard. Many of their menu dishes can be adapted to suit a wide range of dietary requirements, especially with advance notice. 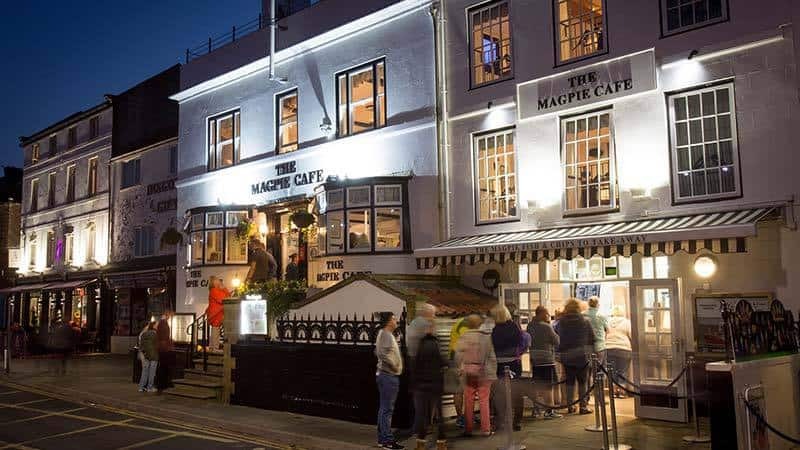 Magpie Cafe, Whitby’s most famous restaurant? Magpie Cafe has developed quite a strong reputation over the years. It has become known as one of the best places for fish and chips in the Whitby area. People have travelled from all over the globe in order to sample fish and chips in the Magpie Cafe. Their plaice and lemon sole have become one of their most popular seafood dishes, along with the more traditional haddock which is naturally a very popular dish throughout the year. Widely regarded by many as “the best fish and chips in the UK”. People travel from all over to sample the food at The Magpie Cafe. 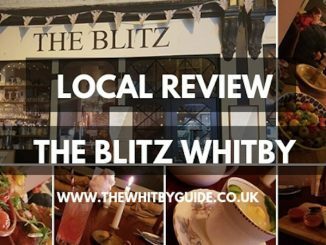 Ditto’s – Whitby’s best restaurant? 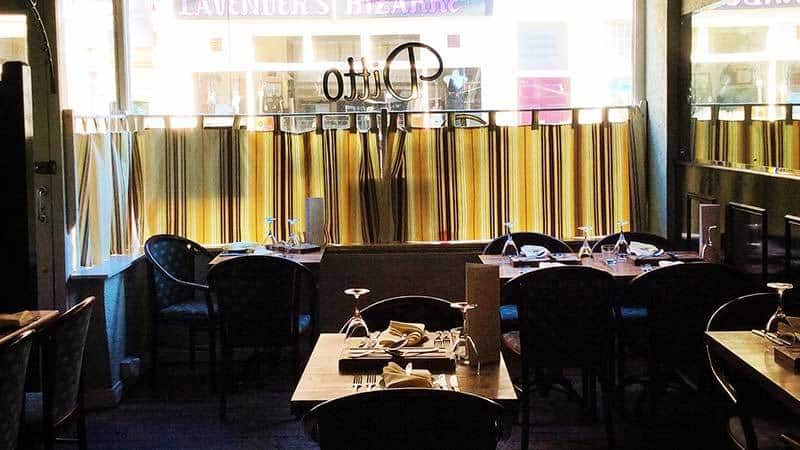 Ditto is a small and intimate restaurant that offers a mouth-watering set-menu. 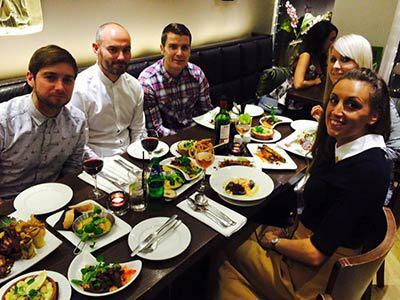 It is a family run restaurant that takes great pride in being able to offer their diners excellent customer service. The restaurant itself is designed to look like an old Italian bistro, which gives an intimate dining experience. Ditto likes to be different from other restaurants, which is why everything on their menu has unique ingredients, flavours and cooking methods. It is a small dining area and they are very popular, so if you want to have lunch at Ditto Restaurant you will need to book in advance. Ditto’s is widely regarded amongst the locals as “the best restaurant in Whitby” and according to Trip Advisor, they are correct. Ditto’s has held the prestigious No 1 spot on Trip Advisor for the last few years. Give it a go yourself and see if you agree. Whitby’s No 1 restaurant on Trip Advisor. Do you agree? Cross Butts Stables (view editorial feature) is nestled in the heart of the North Yorkshire Moors in easy reach of the charming seaside resort of Whitby, a fabulous wedding venue with an award-winning restaurant and luxury accommodation. The Stables pride themselves on freshly prepared homemade food and offer a wide variety of seasonal dishes. All meals are created by a team of highly experienced chefs using locally supplied quality produce. 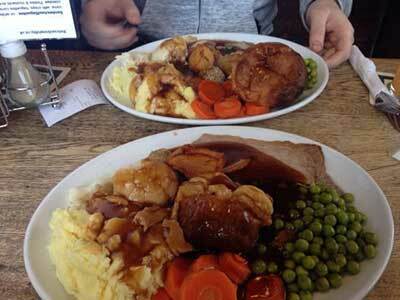 Every Sunday they serve ever popular and traditional roast throughout the day until 6pm. The roast is also available with the Sunday evening menu for those who missed it earlier in the day but crave it later! 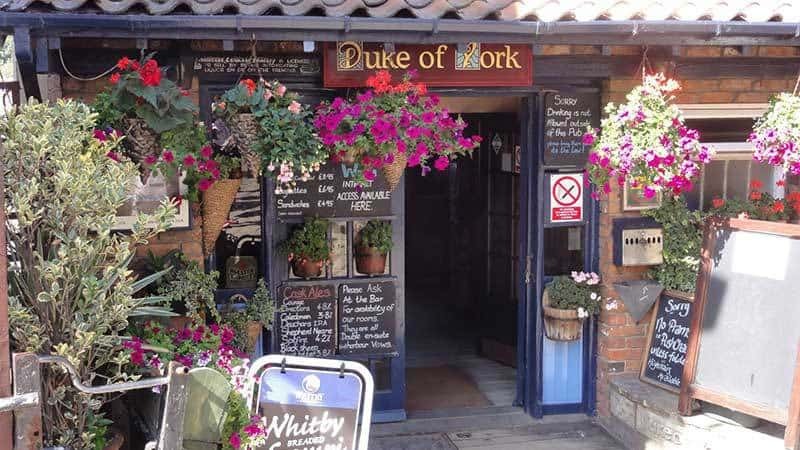 The Duke Of York is a great restaurant to visit if you are looking for something more traditional that has the atmosphere of a good old fashioned local pub. They have a wide range of ales and ciders that you can sample in the bar before heading through to the restaurant where you can enjoy a wide range of high-quality fresh food. They have a range of specials that change daily, so it’s well worth taking a look at their specials board. You will also find a range of memorabilia and historical items on the walls for you to enjoy. 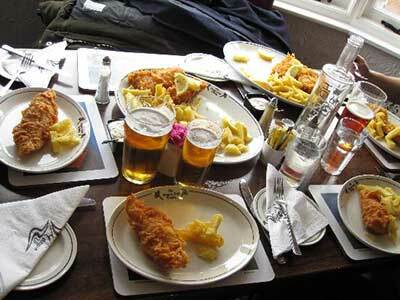 The Duke Of York serves hearty traditional pub food. Ideal for those cold winter days. 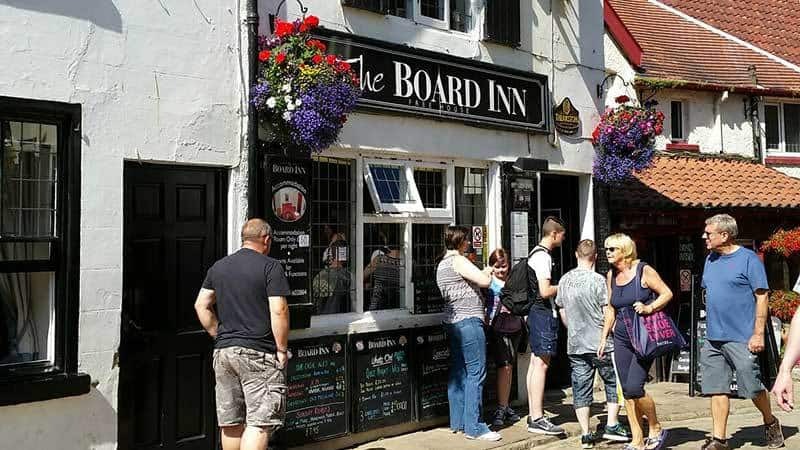 The Board Inn is another popular restaurant in Whitby, overlooking the harbour with stunning views out to sea. They have a dining room that has been recently refurbished and can hold 50 diners. Their menu is also a delicate blend of traditional and modern dishes so then you can find something that will suit your mood. The menu is also always being updated and there is a specials board where you can find some of their speciality dishes. Regardless of if you want a curry or some traditional fish and chips, they will have meals to suit your mood. The Board Inn serve traditional pub grub along with a great Sunday roast! 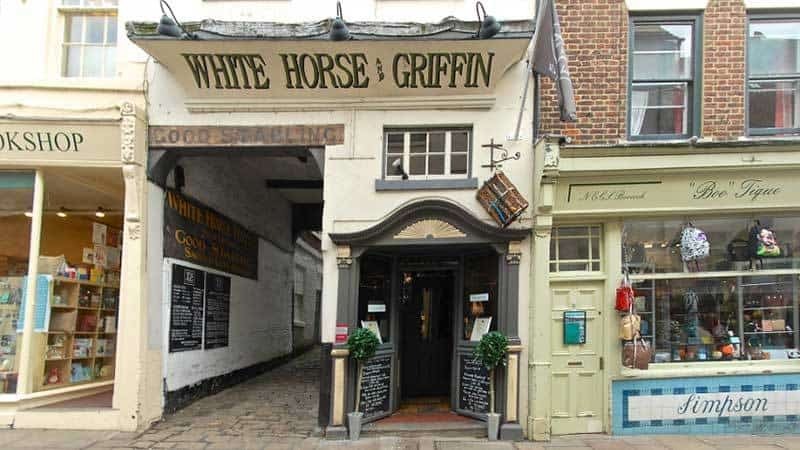 White Horse & Griffin is a wonderful restaurant that takes full advantage of its location. 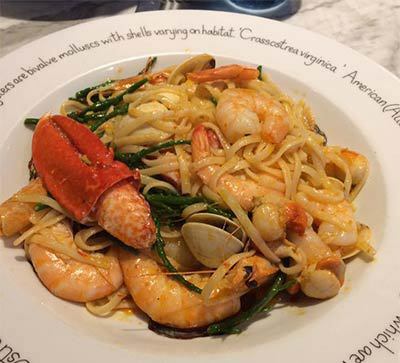 It has a seafood orientated menu where you can enjoy a wide range of traditional and modern dishes, all of which are made with ingredients that have been sourced in the local area. 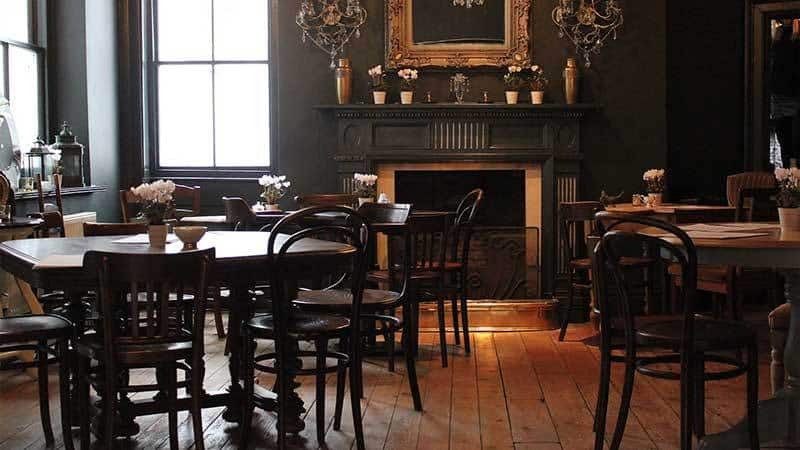 Whether you are just looking for a spot of lunch, or you want to enjoy a nice Sunday lunch with the entire family, the White Horse & Griffin will be able to provide you with a wonderful meal. 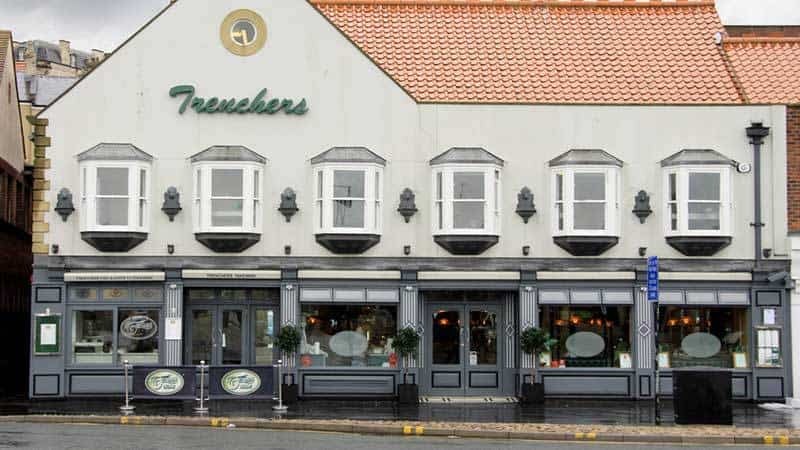 Trenchers takes great pride in knowing that their fish has been caught by the fishermen in Whitby and have been freshly delivered to them. They also enjoy being one of the few seafood based restaurants in the area that offers a takeaway menu for people who want to take their food and sit by the harbour. 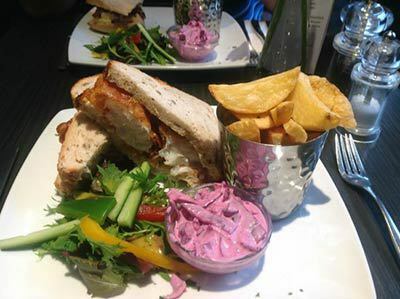 They offer a wide range of meals from starters to desserts and they have a varied children’s menu also. Voted the best fish and chips in Whitby 2014/15 by the readers of the Whitby Gazette. 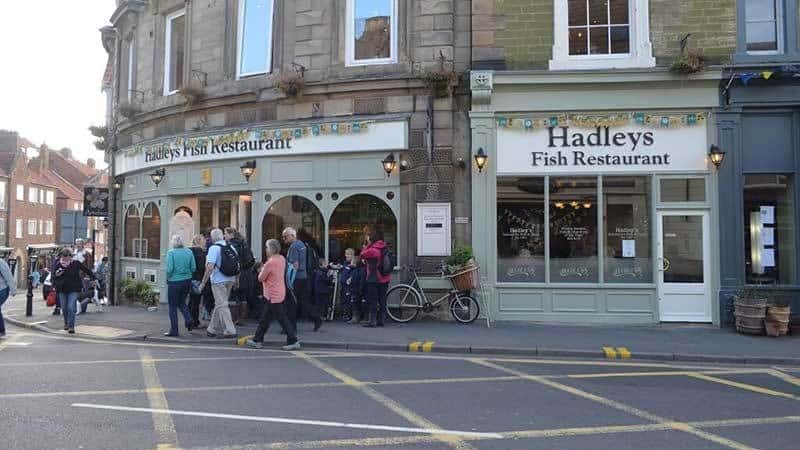 Some claim that Hadley’s serve the best fish and chips in the world, a bold claim indeed, you will have to visit and taste for yourself before passing judgment! Hadley’s has been around since 1937. Its founder, Alan Hadley, believed in quality fish and chips at a sensible price. His beliefs have continued through the years and now with over 75 years experience in the industry, they have perfected the humble fish and chips. If you are in the mood for an Indian meal, then Passage To India is the best place to go. Like many Whitby restaurants, their menu is vast and has something for everyone. It has a wonderful family atmosphere so you can always feel happy taking the kids there for an early evening meal. They also have a takeaway menu, ideal for people with self catering accommodation who want to enjoy a night in. We love Indian food and we want to share our passion with you. Indian Moments have an extensive menu, all dishes are freshly prepared daily by dedicated chefs. Indian Moments is located inside a beautiful historic building in East Whitby – seconds from the swing bridge. It’s fantastic to locate a restaurant inside such an iconic building, retaining its features and serving great indian cuisine. Moutreys is a restaurant that enjoys cooking food the old fashioned way. 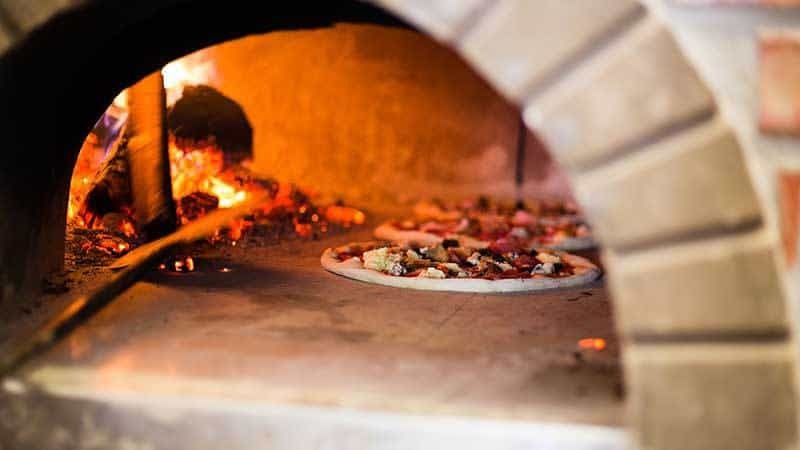 All of their ingredients are delivered freshly on a daily basis and they are cooked on an old wood fired oven. Their kitchen is also open, so you can watch as your food is prepared with tender loving care and using the most traditional of methods. People who have visited the restaurant have raved about the quality of the seafood when it is cooked on their wood fired oven. It is a wonderful place to go with your family, or even for a party. Moutrey’s restaurant in Whitby is one of my personal favourites. My suggestion in the “Americano Hot” pizza, washed down with a bottle of red wine! Cosa Nostra is one of only 2 Italian restaurants left in Whitby. The other been Moutreys. Cosa Nostra serves a selection of pizzas, pastas and other Italian favourites. The central location ensures you are only a stone’s throw away from the town centre. They have a vast selection of wines available along with a variety of beers, spirits and soft drinks. 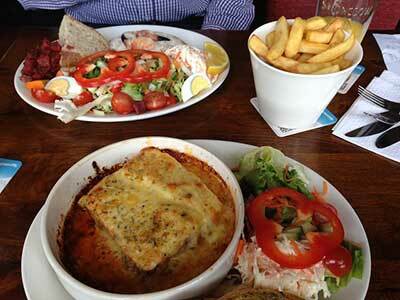 There is a relaxed atmosphere and the friendly staff ensure this is a solid choice when dining out in Whitby. You really can’t go wrong with a pizza or pasta dish from Cosa Nostra, simple, great food at sensible prices. 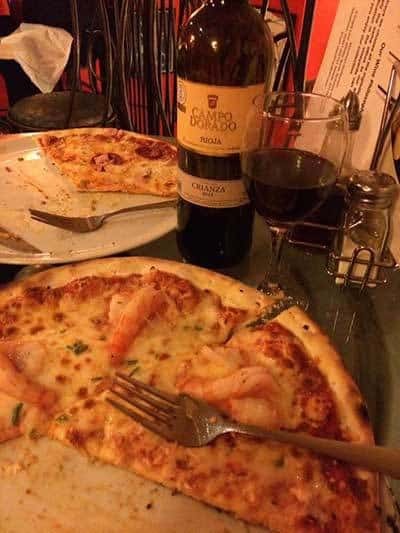 Along with a range of pizza and pasta dishes, Cosa Nostra offers some great Italian specialities. 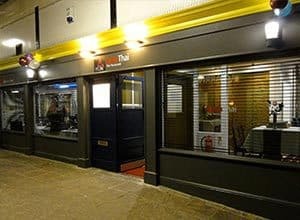 Not always high on everyone’s list when they come to Whitby, Thai food is something which everyone can enjoy, especially the dishes that are served up at Kam Thai. Their menu features a selection of fish dishes, Thai curries and traditional Thai stir-frys along with grilled chicken and beef dishes. 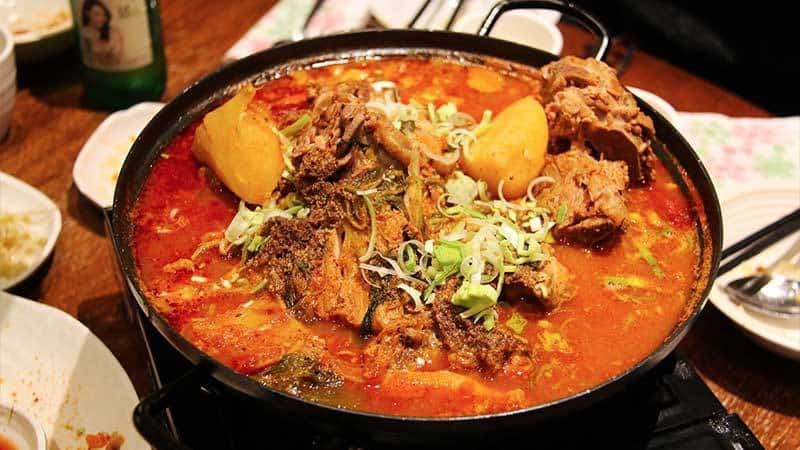 There is plenty of “hotter” dishes if you like to feel a burn in your mouth. This restaurant has recently relocated to Whitby Railway station. 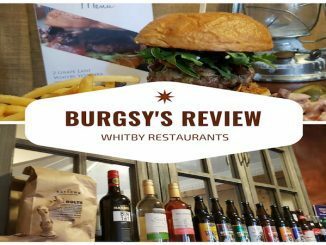 Recommend your favourite Whitby restaurants for inclusion in this article. 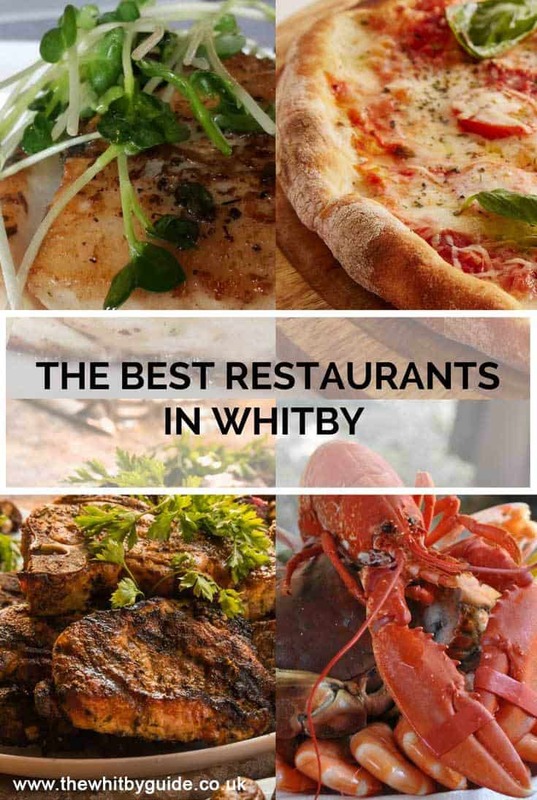 If you have visiting a great restaurant in Whitby and you would like to add it to this article, then please comment below and we will add your chosen restaurant for you. If your using Pinterest and found this article useful, please pin the image below to help us share our content. 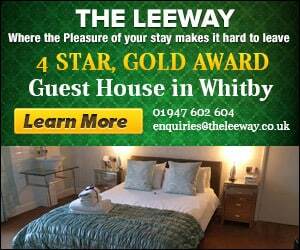 Love Whitby Restaurants? Pin It! I don’t understand the hype around the Magpie cafe. In my opinion, Angel fisheries is far better and a lot cheaper. Blitz cafe served the worst cup of coffee I’ve experienced in over 40 years of living and working around the world. 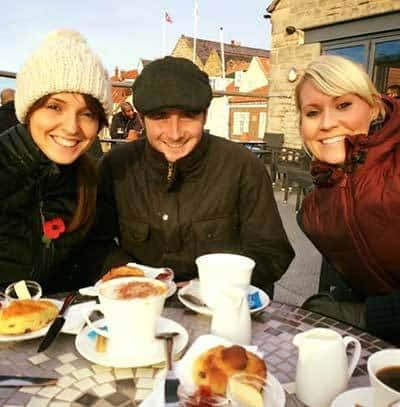 You should include the Singing Kettle – friendly, down to earth and the best (and best value) full English breakfast in Whitby. Java Cafe is also brilliant. Indian moments on church street is a better Indian restaurant than Passage to India, and does not have the same rowdiness. Definitely a step up from the other Indian. More modern Indian cuisine with some good specials. Went to Rusty Shears today and it was excellent, would love to go back and try the afternoon high tea looks yummy! We went to Passage to India as a couple earlier this year. Whilst we were there 2 fights broke out at either side of us and the police were called. Certainly wouldn’t call it a family atmosphere. Didn’t feel safe, it was an awful experience. Sorry to hear about your experience Joanne. Sounds terrible. I’ve visited the restaurant a few times myself over the years but will visit again and see if it still warrants a place in our recommended Whitby restaurants list. Thanks for the comment. Have a great day. Not sure about one or two places on your list, but one that certainly should be there is the The Blitz Café & Tapas Bar on Church Street. It’s new in Whitby and the food and décor is great! Thanks for the recommendation Kev, we will add it to the article when we next update. Come on you have to include Hadley’s ! The best fish n chips in town in fact the best fish n chips in the world ! Hi Mark, we will certainly add them when we update the article. Thank you for the recommendation. Abbey Wharfe deserves a mention – terrific staff & lovely, well presented food & impressive views . Thanks Sue, your comment is approved so they are now mentioned. We will be compiling a more exhaustive list and publishing it shortly. Thanks for contributing.